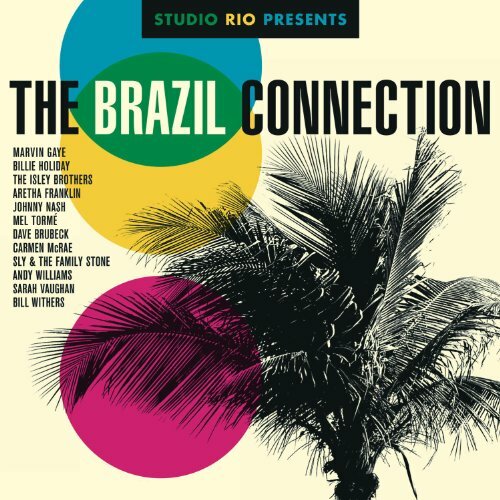 Legacy Recordings, the catalog division of Sony Music Entertainment, will release Studio Rio Presents: The Brazil Connection, an innovative new collection of 12 beloved vocal recordings re-experienced through new samba and bossa nova arrangements created by iconic Brazilian musicians and The Berman Brothers. The perfect summer soundtrack party album will be released in advance of the 2014 FIFA World Cup Brazil™ (June 12 – July 13) with a digital version coming Monday, May 12, followed by the CD on May 27 and a 12″ Vinyl edition arriving June 9. Embracing the All In One Rhythm™ Theme of the 2014 FIFA World Cup, Studio Rio Presents: The Brazil Connection blends 12 iconic performances–from Bill Withers, Aretha Franklin, Marvin Gaye, Billie Holiday, Sly & The Family Stone, The Isley Brothers, Mel Tormé, Nina Simone, Johnny Nash, Dave Brubeck with Carmen McRae, Andy Williams and Sarah Vaughan–with new, samba and bossa nova arrangements and production inspired by the spirit of Brazilian music. Working on Studio Rio Presents: The Brazil Connection project, the Berman Brothers sought out the original multi-track masters and utilized an all-new, state-of-the-art separation technology from Science of Sounds to extract exquisitely pristine and detailed vocals. The newly isolated vocals were then melded with brand-new, authentic backing arrangements played by Studio Rio, an all-star cast of Brazilian musical pioneers from the bossa nova and samba genres, including Latin Grammy Lifetime Achievement Award winner Roberto Menescal and Brazilian musical legend Marcos Valle. Studio Rio Presents: The Brazil Connection is the latest innovative musical project from the Berman Brothers (Frank and Christian), a production team whose previous work includes Rhythms Del Mundo (2006), a cross-cultural album summit which which fused an all-star cast of Cuban musicians including Ibrahim Ferrer and Omara Portuondo of the Buena Vista Social Club with US and UK artists and superstars such as U2, Coldplay, Sting, Jack Johnson, Maroon5, Arctic Monkeys, Franz Ferdinand, Kaiser Chiefs and others. Rhythms del Mundo was released in more than 61 countries and received multiple sales awards worldwide. During the past 20 years, the Berman Brothers have received more than 90 gold and platinum awards, two BMI Awards, a Golden Globe nomination, a Grammy nomination (for “Love One Another,” recorded by Cher) and a place in history for their production and remix of the Baha Men’s colossal hit, “Who Let the Dogs Out.” As producers, writers and publishers, the Bermans have worked with an array of international superstars including Coldplay, Sting, Cher, Real McCoy, Dido, Maroon5, Sophie B Hawkins, Reamonn and members of the legendary Buena Vista Social Club.